I swear I tried to overlook the bacon staring me down from its perch on the top shelf of my fridge but alas, its pull was too strong. Before I knew what I was doing the bacon was frying up in the pan previously meant for STRICTLY vegetables. Oh well, sometimes you just have to go with it… This hearty and (somewhat) healthy mix makes for a great, simple dish – tasty and satisfying. I’m sure it’d be just as good sans bacon, but why deny yourself? First put 1 1/3 cup of water in a saucepan on to boil. Once at a boil add in the cup of cous cous. Add salt, a touch of olive oil, cover and simmer 8-9 minutes. Stir every few minutes. Set aside. Meanwhile, in a saute pan, cook the bacon. Once bacon is crispy place on a paper towel to drain and discard most of the bacon grease. 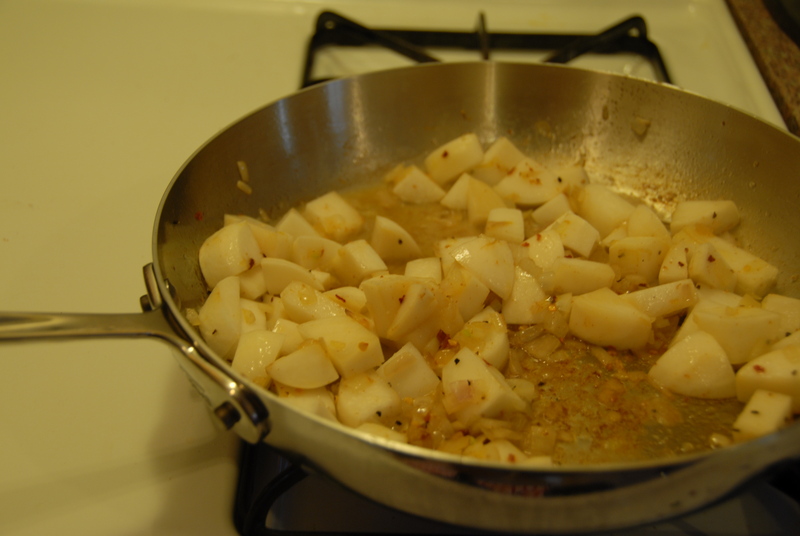 In the bacon fat and a T of olive oil cook the shallots until soft. Next add the turnips. Cook for a minute or two, season with salt and pepper, red pepper flakes and add chicken stock. Let cook for a few minutes longer, until turnips are almost soft. Next add in the chopped kale. You may need to add a bit more oil. Season with S&P. Add the bacon back in, along with the cooked cous cous. Season generously and cook until the cous cous begins to brown and the kale is bright green and crisp. And there you have it – bacon n’ turnips n’ kale – oh my! Try it tonight! 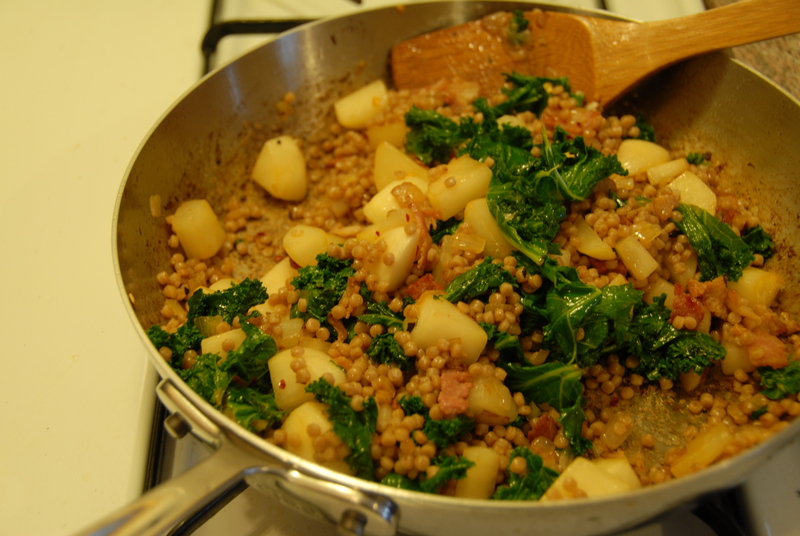 This entry was posted in Bacon, Kale, Turnips and tagged bacon, cous cous, kale, quick, simple, turnips. Bookmark the permalink.